Combining the benefits of cellphones anddeskphones. We're all used to cell phones. Why not have that same freedom of movement in the workplace? Wireless VoIP phones are one way to unchain your workers from their desks, giving them the freedom to communicate on the go. Take a phone call while you're roaming the warehouse, stay connected in the doctors office on a secure wireless line, or get information for a customer while you're standing right in front of them. 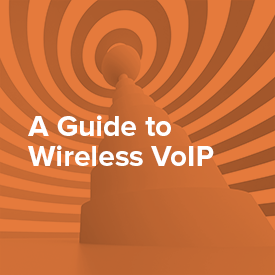 Wireless VoIP phones either have a built-in WiFi or DECT transceiver unit that connects to an access point or base station. Multiple access points or base stations will increase your range (you can evenmakescalls at a wireless hotspot). There are advantages and disadvantages to both - what will work best for you just depends on your application.